Sports Cards Plus, a.k.a. The Super Hit Factory just received tons of Topps Asia Exclusive Products filled with SUPER HITS to give you MORE BANG for YOUR BUCK. 2015 Bowman Draft Baseball is HOT with Prospect Autographs of IAN HAPP, Andrew Benintendi, Dansby Swanson, Kyle Tucker, and Brendan Rodgers. Click HERE to see some of the possibilities. 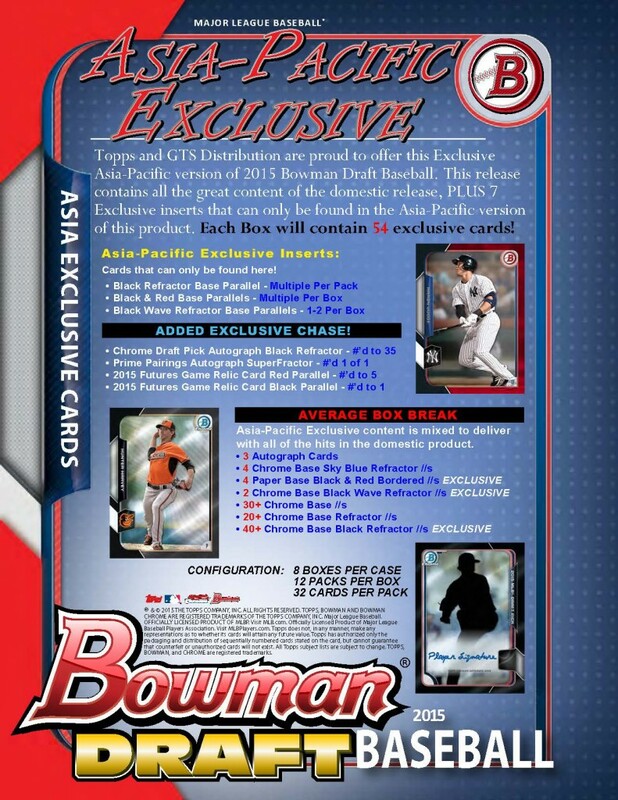 Each 12-Pack box of 2015 Bowman Draft Asia gives everything you find in the American Version (including 3 Chrome Autos per box) PLUS 54 Asia Exclusive cards in every box (on average). Boxes are $270 each or buy them by the pack for $24.95. Each pack gives an average of more than 4 Asia Exclusive cards per pack. 2016 Topps High Tek Asia ($69.95 per box) gives you everything you find in the American Version PLUS an Asia Exclusive Gold Rainbow Numbered Parallel in every box. gives you everything you find in the American Version ($119.95 per box) PLUS an Asia Exclusive Red Ink Breakout Autographs #d/5, Red Ink Prime Performers Autographs #d/5, Asia Exclusive Mystery Redemption Autograph #d/50. The estimated rate to pull an Asia-Exclusive card is 1 in 3-4 packs.